No sleep, caffeine overload, sweats and flip-flops. It’s that time of the quarter again. Even though in a week we’ll be enjoying the sweet taste of summer vacation and, for some of us, graduation, there’s one last hurdle we all have to get over. You probably guessed it, the daunting week of finals! 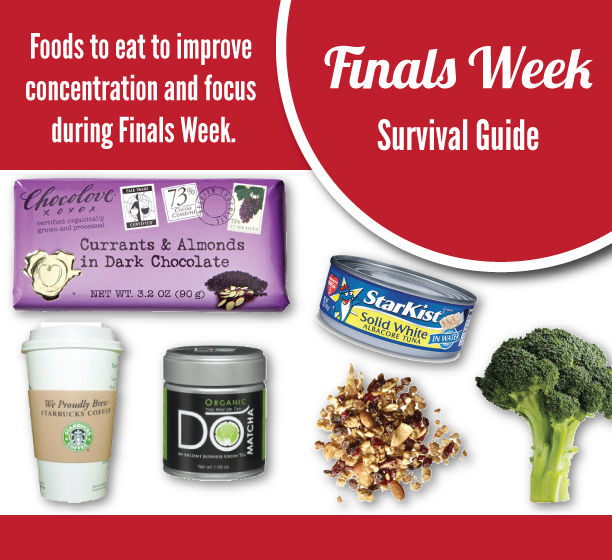 Many of us associate Finals Week with eating fast food and down energy drinks. Let’s take a step back, though, to see how food choices can affect how well we study. During Finals Week we all need that boost of energy while we study, but it’s important to realize not all caffeinated drinks are created equal. Instead of grabbing an energy drink, which contains sugar and empty calories, try drinking Matcha green tea or brewed coffee instead. These beverages don’t have a lot of sugar and empty calories plus they may offer natural health benefits. Keep in mind that 200-300 mg of caffeine is considered a healthy, moderate level. Our bodies convert food into fuel for energy by using folic acid, which is found in broccoli. Folic acid also prevents that feeling of sluggishness. As a quick side to your meal, drizzle olive oil over broccoli florets, season with salt and pepper, and roast at 425 degrees F for 15-18 minutes. By roasting broccoli on non-stick foil, you can study while it’s in the oven and the foil makes for easy clean up. It’s delicious! Try trail mix instead of chips. You can easily make it by combining your favorite dried fruits, nuts, and even chocolate chips! Nuts, such as almonds and cashews, can help you feel energized while you are studying. They are high in magnesium, which produces and transports energy in the body. Sometimes when you’re stressed, all you need is a piece of chocolate. The good news? Dark chocolate has been shown to lower stress hormones in highly stressed individuals. Also chocolate has a number of antioxidants that are beneficial to our bodies. Canned tuna is a great option because it’s inexpensive and can be used for a quick sandwich. Tuna contains 20g of protein in a 3 oz serving, which help you feel full longer. Also, it has high levels of vitamin E and K, potassium, iron, and omega-3 fatty acids. Omega-3 fatty acids are essential for brain memory and performance.